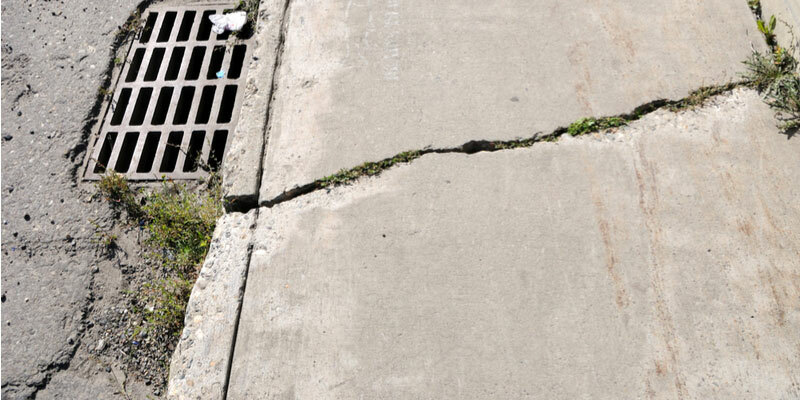 Some common signs that you need to fix cracked sidewalks include trip hazards, holes or gaps in panels, or issues with drainage. Sidewalks should be smooth, level and offer nonskid high-traction, which can be obtained via paver-grade brick or broom finish concrete. Sidewalks are impacted by a lot of different things over time, like unruly tree roots capable of lifting entire panels, settlement, and more—all with a side of day-to-day wear and tear. Sidewalk elevation changes that measure ½-inch are considered trip hazards. Staying on top of cracked sidewalk repairs and maintenance can help prolong surfaces while reducing the risk of injury or accident. 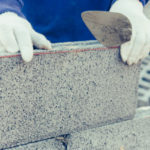 Here are some of the most common types of damaged or cracked sidewalks and some suggested ways to repair the issue and restore sidewalk integrity. Trip hazards are the most important factor to consider when deciding if a sidewalk requires repairs or not. If a sidewalk presents a tripping hazard it needs to be fixed as soon as possible. 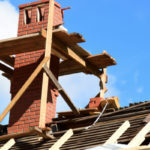 Technically, trip hazards are defined as any changes in pavement that result in ½-inch elevation or more. This applies to expansion joints, joint seams, and edges. Another common sidewalk problem that can present a trip hazard is a hole or gap that measures over one square inch. Large gaps often exist between sidewalk panels, which can easily cause someone to trip or lose their footing. 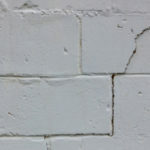 Large holes or gaps can lead to spalling, a term used to define the condition in which the upper layer of concrete begins to separate and come off in chunks. Tree roots can grow as much as double the height of the tree trunk that sprouts from them. Some tree roots grow faster and are more invasive than others, and as a result can cause a lot more damage. Tree roots can cause sidewalk panels to lift clear off the ground, creating a serious trip hazard for pedestrians. Removing the current panel and replacing it with something that can withstand pressure from tree roots. Move the sidewalk so that it’s far enough away from the tree to avoid complex root systems. That doesn’t mean you must move the sidewalk across town. Instead, you could simply add a few curves to the shape of the sidewalk to avoid roots. Remove the tree and plant a different tree with a smaller and less invasive root system. Sidewalks should include proper grading and drainage measures to prevent water from pooling on surfaces. If large pools of water line sidewalks after each rain, it’s just a matter of time before water damage starts to show itself. Make sure sidewalks are outfitted with proper drainage and fix drainage issues as they arise to prevent larger cracks and settlement issues. Cracks and holes in sidewalks allow excess water to build beneath surfaces. As winter sets in, trapped moisture expands on the coldest nights and then thaws and shrinks before freezing again. 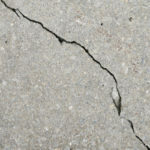 This freeze thaw cycle puts pressure on concrete and causes cracks.